A friendly witch is decorating for her favorite holiday. Image measures approximately 2-3/4" X 2-3/4". This original design by Fran Seiford is deeply etched and precision cut from premium gray rubber on a 1/8" gray rubber foam backing then mounted on a cling vinyl decal with full sized image for easier storage and use with an acrylic handle sold separately. Made in the USA. Penny Black slapstick cling stamp featuring a Halloween themed witch on a broomstick. This 8 piece clear stamp set features old ladies ready for Halloween, with a woman in a bat suit, a witch drinking a martini, candy corn, bats, and a crescent moon. 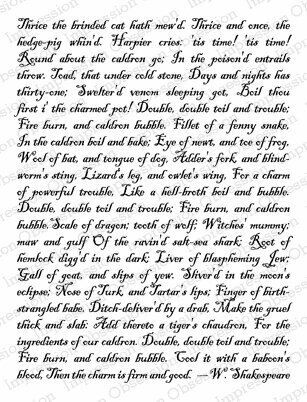 "Black bats are flying and witches are seen here comes the booos it's Halloween!" "Happy Halloween from the old bat!" "I'm here for the booos". 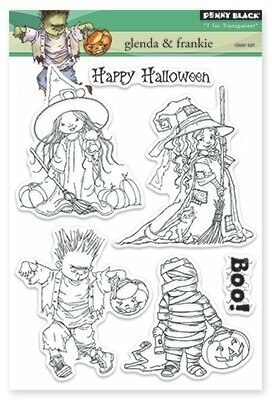 Halloween themed Penny Black clear stamps featuring Frankenstein, the Mummy, and Glenda the Good Witch. Halloween-themed Penny Black cling rubber stamp featuring a witch casting a spell. Impression Obsession cling stamp featuring the Halloween sentiment "free broom parking (park at your own whisk)". New Ai Shakers, includes shaker die and action wobble. This Halloween themed stamp set features a witch with a cauldron and "Best witches for a Happy Halloween". Halloween themed Cling Stamp from Impression Obsession featuring a Witch's Chant. Halloween themed cling stamp from Impression Obsession featuring a Little Witch. Frantic Stamper Clear Stamp Set - The Witch Is In. A 4"x6" set of clear stamps, made of the highest quality, non-yellowing polymer. 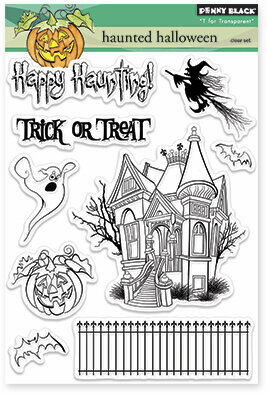 This stamp set contains 18 sentiment stamps perfect for you Halloween cards. Our clear stamps are proudly made in the USA. Cling Stamp from Impression Obsession featuring the quote from the Wizard of Oz "Don't Make My Call My Flying Monkeys". Cling Stamp from Impression Obsession featuring the sentiment "Witch and ghost make merry on this last of dear October's days. - Unknown". A silhouette selfie-taking witch is getting ready for Halloween scrapbooking. Image measures approximately 2" X 3-1/4". This original design by Fran Seiford is deeply etched and precision cut from premium gray rubber on a 1/8" gray rubber foam backing then mounted on a cling vinyl decal with full sized image for easier storage and use with an acrylic handle sold separately. Made in the USA. 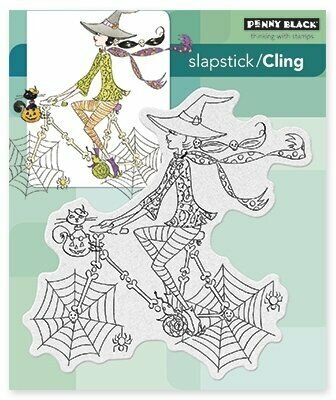 This Halloween themed Penny Black Slapstick Cling Stamp set features a witch riding a bicycle with wheels made of spiderwebs.